Far Cry 5 is a complicated game that needs to convey a ton of information at once. Good thing it’s got a great user interface. Here are a few interface things Far Cry 5 does right, based on about 15 hours with the PC version. The compass is a great mini-map alternative. 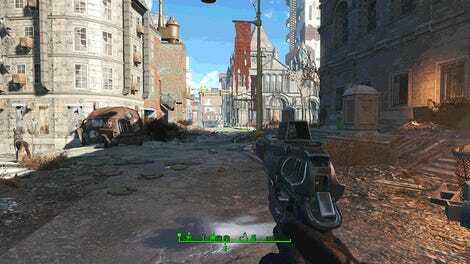 Avid Kotaku readers probably already know that I don’t really like mini-maps. I’ve been glad to see game developers like Ubisoft (and Guerrilla Games, and Bethesda, and hopefully others) out there experimenting with alternatives, moving away from such a long-held, flawed interface mainstay. Last fall’s Assassin’s Creed Origins, also designed by Ubisoft Montreal, ditched that series’ long tradition of traditional mini-maps in favor of a Skyrim-style compass at the top of the screen. Far Cry 5 takes the same approach, dropping the mini-maps that have been in the series since Far Cry 3. The new compass works well, and in fact is maybe works a little bit better than in Origins, since I don’t find myself unsure of the boundaries of a restricted area or investigation zone as often. One of the game’s world icons. For my first ten or so hours with the game, most of my navigation was accomplished via “world icons” that floated over objectives, which would get my eyes up out of the corner of the screen and into the center. I’ve recently begun playing with world icons turned off, which means that I navigate by figuring out where I’m going on the map, then using my compass to stay oriented. Either option works fine depending on how you prefer to explore, and I never find myself missing whatever extra information a mini-map might have provided. There are lots of interface options. It’s always a good sign when I fire up a new game and see an “Interface” tab in the options menu. Far Cry 5’s interface menu offers a lot of individual toggles, for everything from your ammo and crouch indicators to your reticle and health bar. You can toggle off enemy tags, which I like to do, since it makes the game more difficult and exciting. Fortunately you can leave on friendly tags, teammate tags, and co-op tags. That was actually something that bugged me in Ghost Recon: Wildlands, another Ubisoft game that generally included good UI options. If you turned off enemy tags in that game, it meant your teammates were also un-tagged, which could be annoying if they got injured and you needed to quickly find them and revive them. I was also a tad frustrated by the more constrained options in Assassin’s Creed Origins, which only let you turn off enemy tagging through a global preset that turned off a lot of other HUD elements as well. Far Cry 5 improves on both of those games by giving me more options. You can turn off messages about your objectives, challenges, tutorial updates, network, and “warnings,” whatever that is. The more familiar I get with this game, the more of those I’ll probably turn off. Ubisoft’s open-world maps sure have come a long way from the bland, hard-to-parse maps of the early Assassin’s Creed games. Far Cry 5 has my favorite Ubisoft map yet, a 3D miniaturized version of Hope county that looks for all the world like a wee little game of Civilization VI. Only the most important stuff when you’re all the way zoomed out. I’ve circled the little white squares in red. Zoom in another level, and those white squares will resolve into location markers, objectives, and vendors. There’ll also be a new layer of white squares, which tell you that a more granular level of information is waiting if you zoom in closer. The white squares in Fall’s End have resolved into vendor and location icons, and new white squares have cropped up elsewhere, indicating more information if you zoom in further. All icons are now visible, from the highest-level (story missions and sidequests) to the lowest-level (hunting locations and vehicles). It’s so smoothly executed that you might not even notice it. The map is subtly conveying to you that there’s more information, should you want to zoom in and see it. 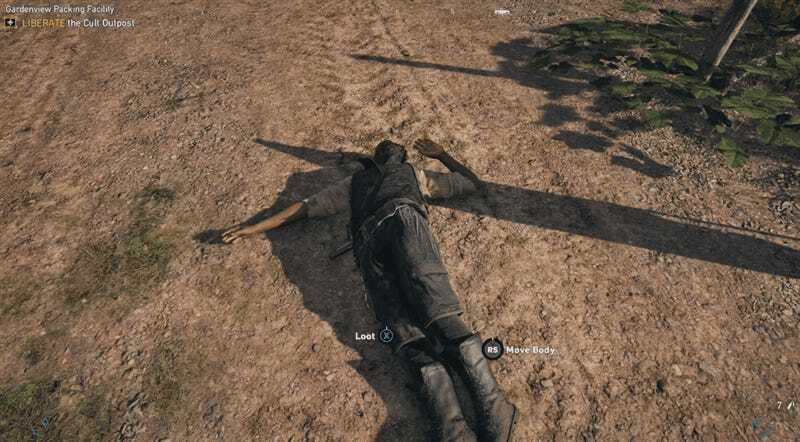 Assassin’s Creed Origins and Ghost Recon: Wildlands both had nice maps, but neither of those games has an equivalent to that kind of “icon foreshadowing,” or whatever you wanna call it. It feels like one of those little ideas that someone had, fine-tuned, and that will likely be built upon in future games. One more (small) example of the many ways Ubisoft’s interface designers are constantly refining their approach and trying new things. The PC interface is great, too. In addition to being an unusually good PC port overall, Far Cry 5 has one of the best PC interfaces I’ve used in a while. It’s not quite on the level of Prey’s bespoke mouse and keyboard interface, but it works better than a lot of other PC games that are also on console, and is a huge improvement over Far Cry 4. Even better, the game makes it possible to seamlessly switch to a controller on the fly, meaning I can use a mouse and keyboard in firefights but control vehicles with controller, which I find much more intuitive. Just pick up the controller, and it starts working. Go back to the mouse and keyboard, and the game switches back. No pausing, no lag. I love that the game makes it so easy to switch between the two, with separate options menus (and separate look-inversion settings!) for each. Another small, revealing bit of polish: mouse and keyboard players don’t have to hold down a button to loot downed enemies, but controller players do. In order to loot a dead guy with a controller, you have to hold down X until the ring around the prompt fills up. With a keyboard, you don’t have to hold a key; you just tap E. That kind of “hold to activate” input method works fine on a controller—it turns up in games from Assassin’s Creed to Destiny—but it feels more awkward on a keyboard. 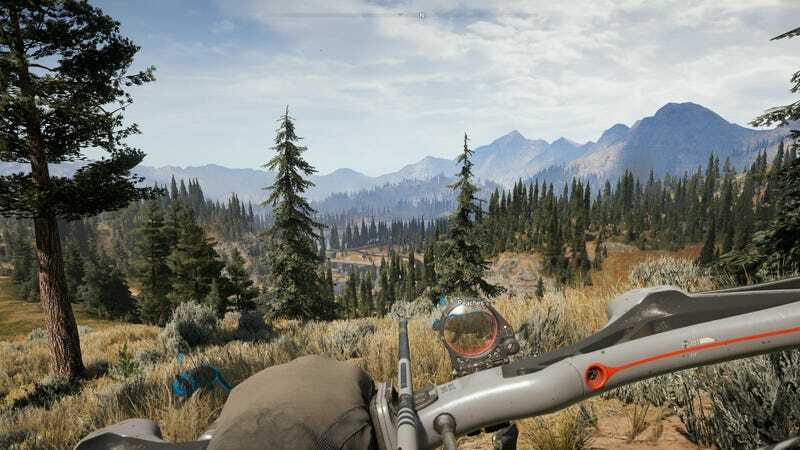 It’s a small but noteworthy difference between the two control methods, since it indicates that the people who assembled Far Cry 5's PC and controller interfaces have put a lot of thought (and work) into making the best experience for both. One last little PC thing that I appreciate: In the Mouse & Keyboard menu, you can remap keys as you see fit. As you do so, you’ll see a keyboard next to the menu that indicates which keys you already have mapped and which ones are free. That’s super helpful, given how many things need mapping, and it’s saved me a lot of time as I’ve been getting the game dialed in. I’m impressed with Far Cry 5’s UI and UX overall, and more broadly with the strides Ubisoft’s studios have been making over the last five years with their approach to this stuff. Ubisoft games used to catch a lot of flak for their cluttered UI, and I can still remember when I was installing imperfect workaround mods for Far Cry 3 in order to limit the junk on my screen. You can practically smell the fresh mountain air. I haven’t experimented with every individual toggle in the game, nor have I messed around with the Arcade creation tool. I can imagine the Arcade presents a UI challenge far beyond anything in the main game, particularly on consoles with a controller. In terms of the general experience playing the base game, Far Cry 5 is in great shape. I’ve spoken with a lot of game developers over the years about user interfaces, and they all agree that designing a good UI is one of the most challenging things about making games. Props to the folks who worked on this game for getting so much right. Update 3/31: The original version of this article described UI as a close cousin to UX, when really it’s just a part of UX. I’ve made that clearer.